AWS CodeCommit is a git host service by Amazon Web Services to store and manage source code, related files and private Git repositories in the cloud. You can use the AWS CLI or the AWS CodeCommit console to track and manage your repositories. 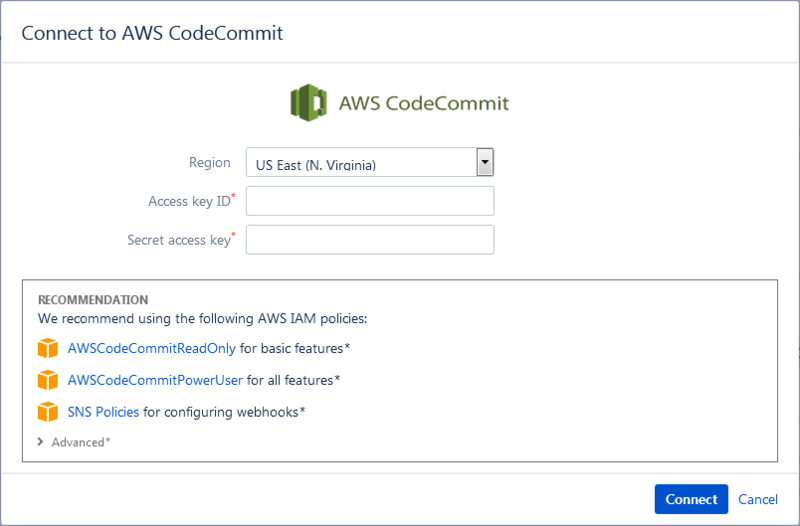 Before performing an AWS CodeCommit integration, make sure to configure the recommended permissions. The permissions detailed in the connect/autoconnect wizard are necessary for specific features to work. CodeCommit doesn't have webhooks but it has SNS triggers requiring a subscription confirmation. For webhooks to work automatically, the IAM user used to setup the connection must have the "configure webhooks automatically" permissions. If permissions has not been set, the repositories are connected but no webhooks are created. While the new UI is not fully functional in AWS CodeCommits, users are required to create triggers via the old UI or with the API. With an existing AWS CC repository, enable triggers then create an SNS topic and subscribe to that topic. For more information on Amazon SNS, see Amazon SNS: Getting Started. This process requires an AWS account with existing CodeCommit repositories. On the Jira navbar, click Git . On the following screen, we recommend to use the Auto-connect integration panel for automatic integration of git repositories. Click the AWS CodeCommit icon. Select the Region where the CodeCommit repositories reside then enter credentials for the Access key ID and Secret access key. On the following screen, Git Integration for Jira add-on will read all available repositories from your AWS CodeCommit account. Click Import repositories. Repositories of the logged-in AWS CodeCommit user can be automatically connected to Jira Server. Repositories that are added or removed from AWS CodeCommit will be likewise connected or disconnected from Jira Server. On the Integration Settings, setting the Require User PAT option to ON, will require users to provide PAT specific for branch and pull requests creation/deletion (via the developer panel on the Jira issue page). For more information on this feature, see Integration Settings: Require User PAT . The Git Integration for Jira Server add-on supports tracked folders for AWS CodeCommit git repositories. The connected git host is scanned for existing repository folders. 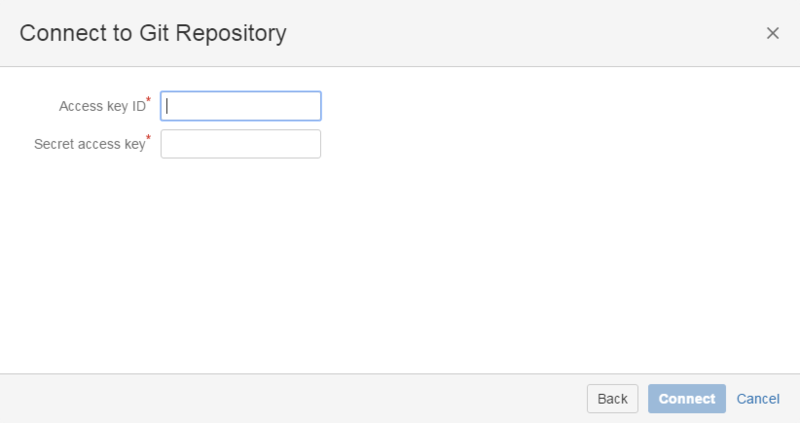 The found repositories can then be added to the Git Repositories configuration. connect via Connect to Git Repository dropdown > AWS CodeCommit. If the connected git host has newly added repositories, the Git add-on will automatically add them to the git repositories configuration on the next reindex. For the deleted git repositories, these will be removed from the Git add-on repositories configuration on the next reindex. Connect a single AWS CodeCommit repository manually to Jira via HTTP/HTTPS connection. Use the host HTTP/HTTPS URL of your AWS CodeCommit repository. 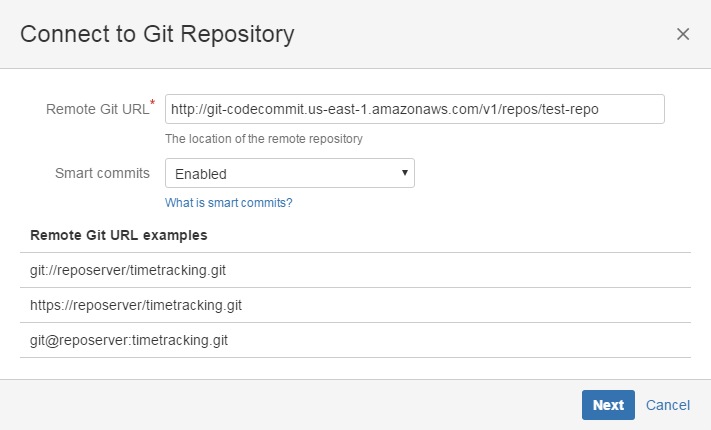 For example, http://git-codecommit.us-east-1.amazonaws.com/v1/repos/test-repo and paste it on the Connect to Git Repository screen. On the Authentication screen, enter the Access Key ID as the username then the Secret Access Key as the password. Connect a single AWS CodeCommit repository manually to Jira via SSH connection. SSH connections are handled automatically if the PUBLIC KEY was added in the AWS IAM console and the associated PRIVATE KEY was added/uploaded on the Jira side (Git Integration for Jira > SSH Keys > Add SSH Key). If authentication issues are encountered during connecting an AWS repository to Jira, modify the original URL by inserting the SSH Key ID as the username. The SSH Key ID is an alphanumeric sequence provided by AWS IAM when importing a PUBLIC KEY for a particular user account in IAM. The modified URL can now be used as a valid repository URL via Git Integration for Jira > Connect to Git Repository. The Git Integration for Jira add-on automatically configures web linking for AWS CodeCommit repositories in Jira Server. This section requires the necessary permissions for all features. If there are several repositories with the same name, the listed AWS CodeCommit repositories will have their names attached with an AWS CodeCommit owner name. For example, johnsmith/second-webhook-test-repo. The pull request is also ready for approval by the reviewers in your AWS CodeCommit web portal.